This book is a great addition to anyone curious about motorcycle history. It is a must-read for the person interested in the Velocette marque. Unfortunately it is also a rare, out-of-print book that collects three digit prices in online sales. So, do what I did, borrow it from a friend and absorb as much as possible before returning the book (in the same condition it started in). 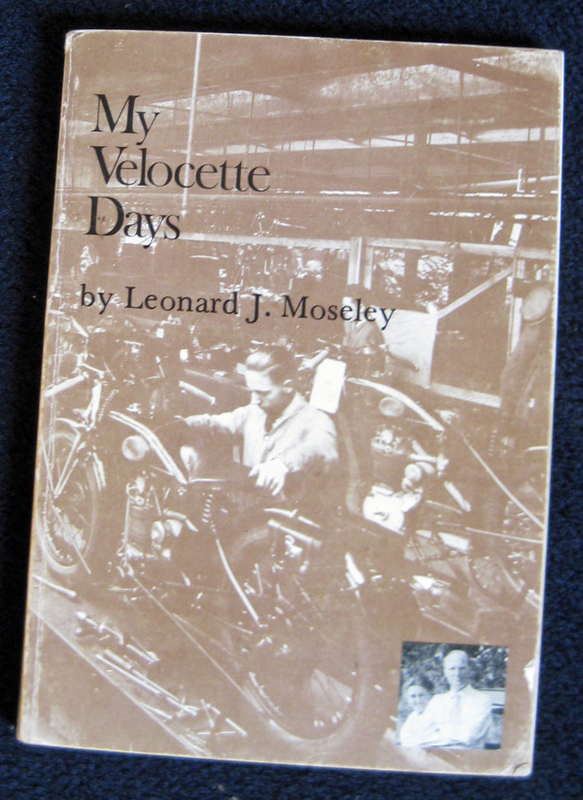 My Velocette Days was written by Leonard J. Moseley, a man who worked at the Velocette factory for 48 years, from March, 1923 at the Six Ways factory, through Hall Green and the subsidiary factory in the Fillerys Toffee Works in Greet, Birmingham and back to Hall Green, until 1970, just before liquidation of the company. The linear structure of this book is chock full of names, both of motorcycle models and the people who were involved with the company. Racing history and the motorcycle shows are also included as they involved the author directly. Overall, this book illustrates the arc of a small manufacturing company during a certain era of human history. Innovative design and the attention to quality made the name, Velocette, known to the motorcycling world. Great success in the competitive world of racing and record-setting increased the popularity of the product. World War II changed all of this. During the war, the Velocette factory stopped producing motorcycles and worked mostly on aviation equipment. After the war, well, the world was just changing too fast and in ways few leaders could predict. Moseley describes the decades of his experience succinctly. In very few words, he captures the excitement of the pre-war years. Winning the prestigious the Isle of Man T.T. was the epitome of success. To describe the war years, Moseley keeps to the facts of war contracts and numbers of people working, but the pain of these years comes through. After the war, he was asked to step down from a foreman position to an under-foreman role, and he mentions having a few moments of hard feelings, but does not dwell on this. Instead, he shows the exhilaration of resuming pre-war activities such as racing and motorcycle shows. Throughout his description, Moseley includes thoughtful perspective about how world events and economics influenced the quality of the labor force. The demise of the Velocette company is depicted in facts such as production numbers and the departure of other characters. Only the passage of years shows how excruciating this process must have been. Moseley gets caught up in a few words of self-pity in his later years, but he expresses little bitterness. Primarily, Moseley depicts the camaraderie and innovativeness that the Velocette marque resonated with in the last century, a mystique that inspires dedicated fans today. Black and white photos from a variety of sources are included throughout the book. In addition there are three appendices which include more photos as well as specifications for some models. This entry was posted in Books, Velocette & other British Motorcycles and tagged book review, Hall Green, Lanora Cox, Leonard J. Moseley, motorcycles, Six Ways Factory, Velocette, vintage motorcycles. Bookmark the permalink. Motorcycle History is Good History. Thanks for the suggestion!